Poster of James Joyce at the Martello Tower, featured in Ulysses. June 16th marks 2018’s celebration of Bloomsday, a literary anniversary commemorating the date upon which Irish author James Joyce set the events of his iconic modern novel Ulysses. Since the masterwork’s first publication in 1922, Joyce’s insightful, no-holds-barred portrayal of the inner lives of turn-of-the-century Dubliners and mastery of English and other languages has proven a source of equal parts shock, recognition, and inspiration to readers on both sides of the Atlantic for more than nine decades. The influence of the novel and its characters remains powerful even today, particularly visible in the numerous international celebrations of Bloomsday. See if one is near you! 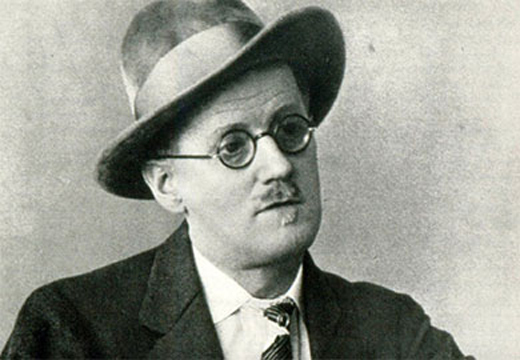 Dublin’s James Joyce Centre launches the Bloomsday Festival on June 11th, kicking off a six-day extravaganza featuring a plethora of events with a Joycean twist. Including an exhibit of Irish art inspired by Joyce’s work, a presentation of a musical score based on pieces and events portrayed in the novel, and a bus tour of Dublin using Ulysses as a road map, the schedule is also chock-full of Joyce-related activities that promise an informative, entertaining experience. Tickets can be booked at www.bloomsdayfestival.ie. Montreal shows an appreciation for Joyce as well as its Irish strain with the annual Festival Bloomsday. Beginning June 12th, the events start with a free concert of live cabaret performances, and end on the 16th with a dramatic performance of Molly Bloom’s internal monologue that closes Ulysses, with multiple exhibits on Irish literature and culture. Activities also feature a lecture on the impact of Irish migration to Canada and an eerie “Ghost Walk” centered on Irish figures. Spaces can be reserved for individual activities at https://bloomsdaymontreal.com/2018-events/. Toronto rings in 33 years of celebrating Bloomsday in 2018, hosting a free, family-friendly morning of local festivities on June 16th. 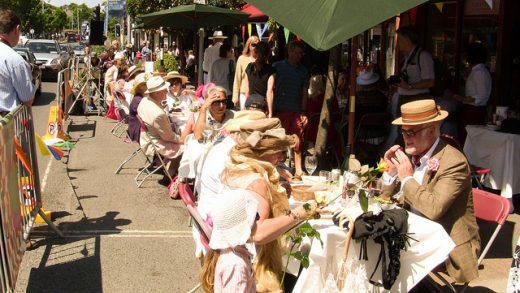 Offering a host of dramatic readings from Ulysses, a sing-along showcasing “Anna Liffey”, and a Bloomsday brunch, Toronto’s Bloomsday also encourages period costumes and participation in the Ulysses quiz. Participation is free and welcome. For a complete schedule, visit http://torontobloomsday.com/. 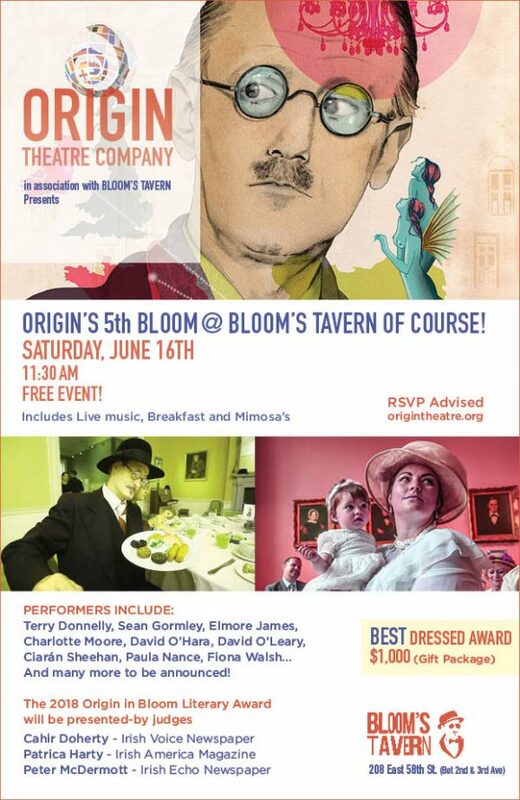 Origin Theatre Company’s Artistic Director, George C. Heslin and Bloom’s Tavern are holding its 5th Bloomsday breakfast at Bloom’s Tavern on June 16th at 11:30am. On the day, there will be performances of live readings of Joyce’s works, live music, and of course breakfast with mimosas. Our fearless leader, Patricia Harty will be there as a judge for the 2018 Origin in Bloom Literary award along side Cahir Doherty of the Irish Voice and Peter McDermott of the Irish Echo as well. The Irish American Bar Association of New York hosts its ninth annual commemoration of Bloomsday at Federal Hall on June 11th, at 6 pm. Featuring keynote speaker Caitlin Halligan and dramatic readings of Ulysses, this event pays special attention to the novel’s significance as a test of First Amendment rights in the United States, as scandalous content for its time made publication difficult. Register online at http://www.iabany.org/content.aspx?page_id=87&club_id=367565&item_id=820158. Costumed attendees receive a $20 discount on admission! The Irish Arts Center and Symphony Space join forces to present a one-night-only dramatic enactment of select chapters of Ulysses. Offered June 16th at 7 pm at Symphony Space, the performance features musical accompaniment and will be followed by an after party at Bar Thalia, with performances by award-winning Irish musicians: fiddler Dylan Foley and flautist Isaac Alderson. The Rosenbach, a museum and library of rare books, is celebrating Bloomsday at Delancey Place where Joyce enthusiasts can drink and listen to a day long reading of Ulysses that features local public figures, literati, and other personalities. Attendees can also visit the museum’s exhibitions which include original pages from the manuscript of Ulysses as the museum’s namesake, Dr. Rosenbach bought the manuscript at an auction of John Quinn, the lawyer who defended Joyce in 1920. You can read about that here. Dear Ms. Mary, Thank you for mentioning John Quinn a man to whom all we Irish-Americans owe so much. I can assure you that San Francisco will also be celebrating with readings and so on. My greatest teacher, near the end f his life, was re-reading Joyce and exclaimed, “This guy doesn’t love anyone!” What do you make of that?.